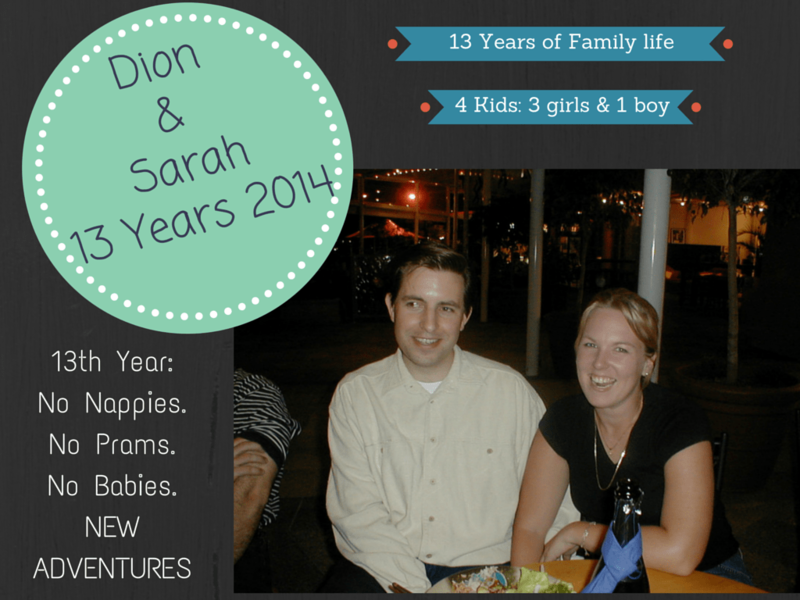 On Monday, the 1st of December, hubby and I will be celebrating our 13th wedding anniversary! I can’t believe we have been married for 13 years! We have travelled a long way from our wedding day on the 1st December 2001, but in many ways, it still feels like we started our lives together just yesterday…..well maybe a couple of weeks ago. Thirteen years has gone so fast. Today, I thought I would share with you our love story. 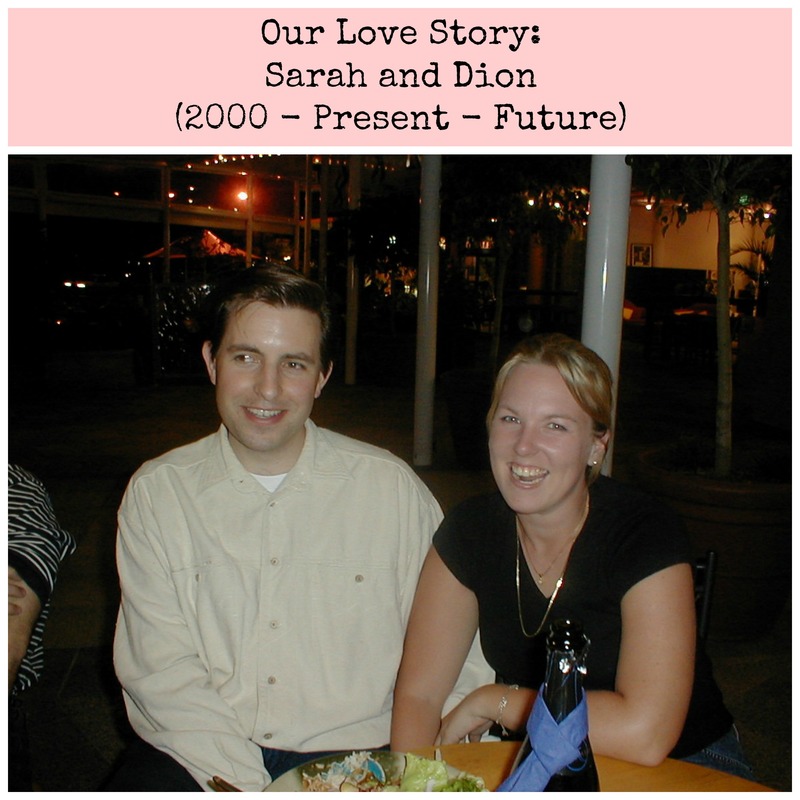 Its the Dion and Sarah Love Story – I’ll probably never be offered a million or two dollars to buy the movie rights so its safe to assume this is a safe place to share and walk down memory lane. So here goes. I went along to the Cotton Tree Christmas Carols with my friend Nic. We had found a great spot to relax and chill out together when Nic got a call from her then boyfriend trying to find out where we all were. Within a few short minutes, Dion and his mate (Nic’s then boyfriend, ‘Max’) turned up wearing roller blades. 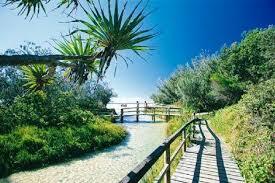 They had roller bladed from ‘Max’s’ offices in Maroochydore to the Cottontree parklands. When I first saw Dion, I was immediately attracted to him, and then he came and sat down next to me. It wasn’t really an easy place to chat – but we did have a mini conversation. After the fireworks my friend Nic suggested that we meet for coffee at the coffee club in Mooloolaba. I’m not sure why Nic didn’t offer to give the guys a lift, but the guys roller bladed from Cottontree to Mooloolaba. NCI said there was chemistry between Dion and myself! Dion turned up at the Coffee Club in Mooloolaba with blood running down his leg – he had a massive stack on the way to the Coffee club. ‘Max’ told me that Dion was in a hurry to get to the coffee club to catchup with us me. Dion used a massive stack of serviettes from the Coffee club to clean up his knee. I felt sorry for the guy. I have been told that I had intrigued his interest! My friend Nic loves music. She plays the guitar, writes songs, and she played guitar in a grunge band years ago (I hope I got the grunge term right). She has a wonderful memory for all types of facts about artists and bands. Dion and Nic talked for ages. I am not wired like this – I never remember these types of facts. In fact, I’m lucky to remember the chorus part of a song. I always get the words of songs wrong and I can’t hold a tune. So as I sat and listened to the conversation between Dion and Nic. I remember thinking to myself that if this Dion is a music freak – we are not going to have anything in common. I am not a musical in any way at all. This is crazy! Maybe there was no chemistry at all. As we sat at the coffee club chatting, I was convinced that Dion and I had nothing in common. Have I ever mentioned I sometimes jump to conclusions? The next day Nic and I decided to head down to Southbank, to do something different. Brisbane City is beautiful at night time and we thought that there had to be something going on in the city. It was the 18th of December, and it so happened that Southbank was hosting the ‘Singing Christmas Tree’ in the Piazza. One of the Brisbane Assemblies of God churches had organised a massive free event to encourage Southbank visitors to see the performances for free. It was fantastic….they even had live animals. I don’t think Southbank parklands could have been any more decorated than it was…Christmas was everywhere. The evening before Dion had mentioned he was going to be down at the Archerfield go-kart race track for their work Christmas party, so Nic decided to call Dion and let him know that she and I were going to be at Southbank – and would he like to meet up with us. He said Yes! We all had a fun night down at Southbank, and enjoyed the fireworks before we all headed back to the Coast. There was chemistry between Dion and I, but we would have to see where it would lead too. We went on our first official date the next afternoon….and the rest you can say is history. We had spoken about the topic of marriage a number of times through out our relationship, so when our friends got engaged, and I had heard that they had a ‘So how ’bout it’ type of conversation for the proposal’, I had said to Dion that if he was to propose to me that I wanted something a little romantic and a little thought out. I wanted a story we could tell our kids – that was at least a little bit romantic. Dion told me he was going to be picking me up at 4.30 am on Saturday the 25th August 2001. He gave me a list of things I would need for the day – but the rest was going to be a secret. On the day, It was 4.30am, it was cold, but I was ready. We travelled North. I occasionally asked questions, but was told to stop asking because he wanted it to be a surprise. We parked at the Hervey Bay airport. Our wedding was simple and elegant. 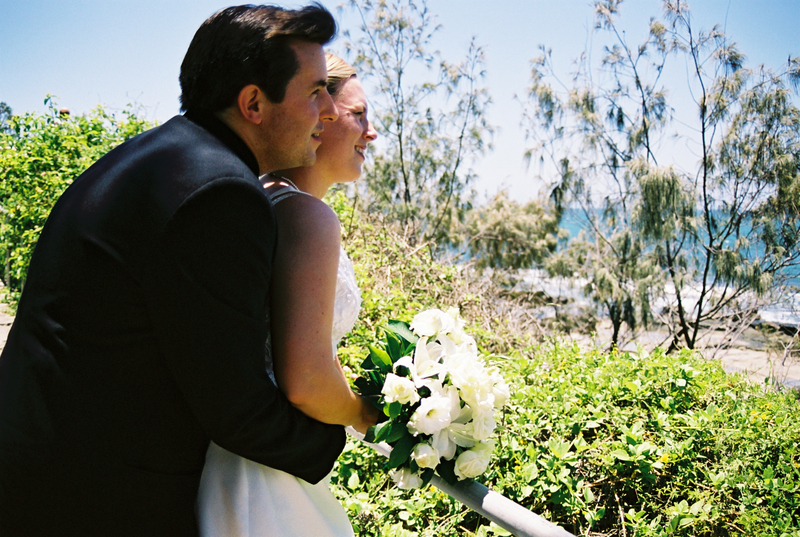 Our ceremony was at the Uniting Church in Mooloolaba, and then we had our reception at a beautiful restaurant called ‘The Outlook’, in Mooloolaba. These days we finish each others sentences, and we often know each others thoughts telepathically. While I am not sold on the idea of getting older, I do like being 13 years down the track. Its a nice place to be in our relationship. We have bypassed the 7 year itch, bought 2 homes – and renovated (still renovating), and we’ve have been growing 4 beautiful children. We have had struggles when we lost grandparents, parents, and a baby, but we have had so much joy as well. I’d love to hear your love story…!